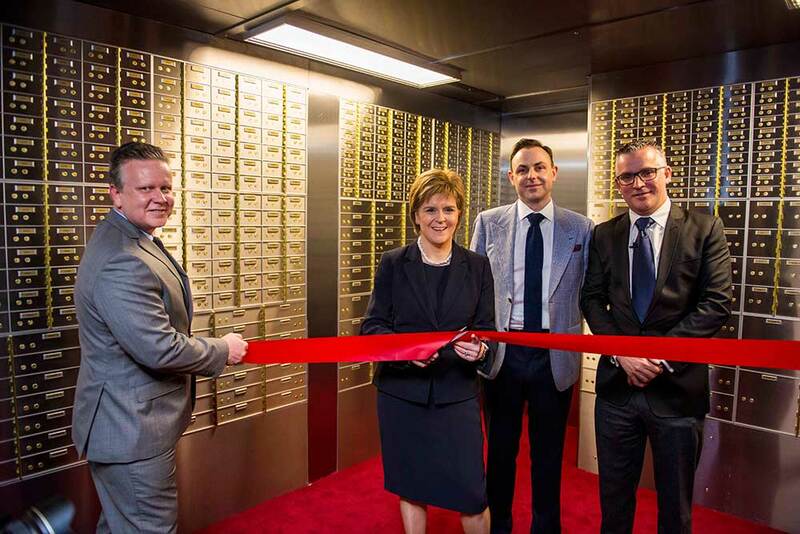 Nicola Sturgeon MSP has officially opened Scotland’s first independent safety deposit box service in Glasgow. Based in the city’s southside, Glasgow Vaults has been introduced in response to the major banks withdrawing the service that safeguards people’s valuable possessions. The venture is being led by David Walsh and Seamus Fahy, who have invested in the region of £1m equipping the vault with the latest state-of-the-art surveillance technology, including seismic shock sensors, 24/7 monitoring and biometric identification technology. Employing five staff, the Glasgow facility is part of a strategy to expand the model across the UK and Ireland, following the successful launch of its first site in Dublin in 2013. The business is expected to grow its staff numbers in Glasgow to 15 by the middle of 2017. Seamus thanked the MSP for her attendance, as he revealed that Glasgow Vaults is already growing a strong customer base with both homeowners and the local business community. He said: “Firstly I would like to thank Nicola Sturgeon MSP for her attendance and support as we launch a new service in Scotland, it is very much appreciated. “We launched in Dublin three years ago, very much in response to demand from people who had either lost confidence in the banking system or were looking to keep possessions safe amidst rising crime figures. “The business has delivered consistent growth and we have been exploring opportunities to grow our footprint across other UK regions. “After considerable due diligence we identified Scotland as a key growth region, mainly due to the fact that the banks no longer offer the service and there are no other providers in the market place. Typical items stored in a safety deposit box include cash, jewellery, family heirlooms, gold bullion, Title Deeds for a property, memory devices, watch collections and passports. With latest Police Scotland figures showing that there were 20,607 reported housebreakings in Scotland in 2014/15, Seamus expects demand for the service to grow. To meet this demand, Glasgow Vaults has in the region of 10,000 boxes, which come in ten different sizes and start from £150 a year. Client have unlimited access seven days per week and there is no appointment necessary. Seamus added: “While crime overall is falling, figures show that housebreakings remain high and thieves are certainly becoming more and more sophisticated in their efforts to target properties – making it vital for individuals and business owners to safeguard their valuables and money. “Complete peace of mind can only be given through the use of a safety deposit box, which is why an increasing number of people across Scotland are turning to us to provide a convenient and affordable way to protect valuable possessions. The vault is open 362 days a year, and was designed in partnership with security consultants working on behalf of insurer Lloyd’s of London.